Dreams tell old man Paul T'Sosi he's dying. So why is Navajo trickster, Magpie, trying to tell him a far more terrifying secret? Hungry for revenge, Ma'iitsoh Dine', the Navajo Wolf, is out for blood. Summoning his darkest powers, the Witch of Ganado circles tribal investigator Charlie Yazzie's young son and close friends. Some may survive the witch's evil vendetta, but others will die to settle an old score. Critics describe R. Allen Chappell's writing as 'embedded and close to the ground' with an intuitive knowledge of the Navajo people and their land. 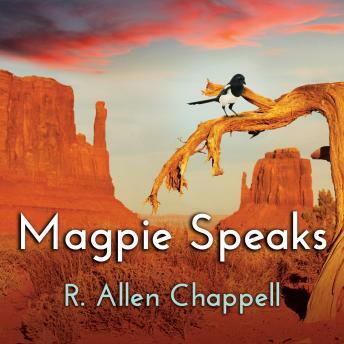 Magpie Speaks, the follow-up to the widely acclaimed thriller Mojado, cements Chappell's legacy and puts him in the forefront of modern-day Navajo mystery storytellers.